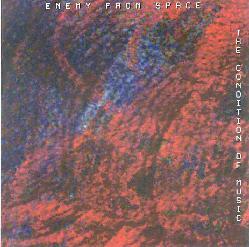 Enemy From Space - "The Condition Of Music" / Electric Lawnchair - "Double Platinum"
Great name for a transwarp driven space rock group but Kelly Shane (who is Enemy from Space) concentrates more on eccentric synth arrangements, unconventional song structures, and quirky electronic effects, ultimately achieving an intriguing compromise between electro-pop surrealism and Eno-esque ambient music. But Shane’s musical antecedents are definitely difficult to pin down, and he certainly stamps his own imprimatur on the twelve songs that comprise The Condition of Music. “The Akropolis of Desire” and “A Most Unusual Gift of Love” are almost nouveau romantic in conception, with cascading synthesizers sparkling and shimmering like a rising tide crashing on a nocturnal windswept coastline. However, Shane’s choice of eccentric background effects adds a distinctive color rarely heard in music of a similar hue and cast. The closest parallel here might be the Cluster of Zuckerzeit, perhaps Bill Nelson’s ambient work of the 80s (particularly his soundtrack work, Das Kabinet and La Belle et la Bete), and the work of French pop-synth auteur Pascal Comelade. Songs such as “The Condition of Music” and “Colorless Green Ideas Sleep Furiously” weld together in a dizzying fashion fragments of electronic rhythms, chimes, stochastic synthetic beats and sequences that constantly shift from major to minor to diminished scales and move effortlessly from one timbre to another. Very odd, very disturbing, and never repetitious or jaded. This is definitely boundary dissolving electronic music, sometimes cinematic in scope, and at other times wildly eclectic in its persistent attempt to evade the characteristic monotony that often plagues even the best artists who consistently work in this genre. If you’re looking for something left of center, The Condition of Music certainly won’t disappoint the Dadaist in you. Double Platinum is a collaborative effort between Enemy from Space’s Kelly Shane and Canard’s Mike Coleman that’s almost impossible to categorize. Take twenty classic song titles from KISS’s lengthy rock dossier, then construct a series of eerie electronic soundscapes, marry the two together in a blissful moment of Dada-esque inspired lunacy, and the result is maybe the strangest “cover” project ever conceived. Appropriately, Electric Lawnchair’s deconstructions of such KISS classics as “Rock & Roll All Night,” “Detroit Rock City,” and “Calling Dr. Love” bear absolutely no sonic resemblance to the originals. But of course that’s precisely the point, and if you’re not into wry, ironic cosmic jokes chances are you’ll be totally baffled and confused about Electric Lawnchair’s agenda on Double Platinum. No instrumentation credits are given on the sleeve, but an assortment of electronics, synthesizers, drum loops and guitars seem to be the primary weapons of choice EL employs to utterly annihilate the KISS canon. One can’t help but wonder what Gene, Paul, Peter and Ace would make of this amusingly twisted “anti-tribute” to what once was “the hottest band in the world.” The pieces themselves are generally brief vignettes of crazed, hyper-kinetic electronica assembled into a reconstituted montage, some of which is very catchy, some of which is simply strange beyond description. The closest parallel to Electric Lawnchair’s aesthetic would perhaps be the abstract “punk concrete” of Dome. Quite jolting, to say the least. One thing is for sure, it took some major balls to conceive and realize a project that some people might simply take as a bad joke done in poor taste. On the contrary, judging from this eccentric disc, Electric Lawnchair may turn out to be the new millennium’s answer to the Bonzo Dog Band. 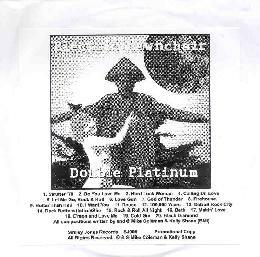 The Condition Of Music and Double Platinum are distributed by Smiley Jones Records. You can visit their web site at: http://smileyjones.com. Contact via snail mail c/o Smiley Jones Records; 8 Townview Rd; Rome, GA 30161.